Drummer Mike Spearman and his Everything Everything bandmates paid a recent trip to the brand new BIMM Manchester. The band headed to the educational facility for a student Q&A session. Of the band's visit, Vaseema Hamilton, Principle of BIMM Manchester, said: "We were delighted to welcome Everything Everything along to our new facility at BIMM Manchester. 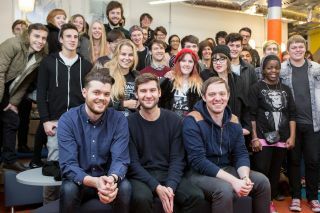 At BIMM we pride ourselves on giving students the opportunity to learn from industry experts and gain invaluable insight into how the industry works from the inside." In 2013 BIMM opened new sites in Manchester and Dublin, adding to existing facilities in Bristol and Brighton. BIMM is currently recruiting for the 2014-15 academic year in Manchester and across the group, for more information please visit http://www.bimm.co.uk.